Pumpkin spice isn’t just for lattes! 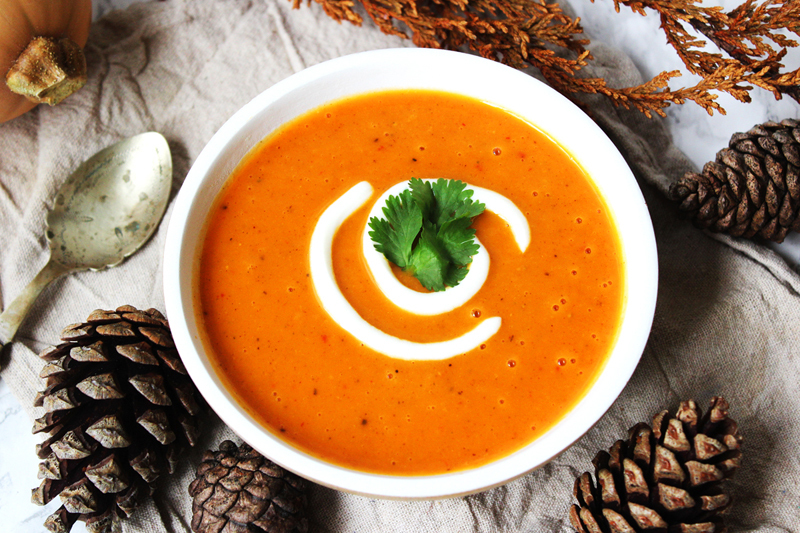 Check out this recipe for a sweet but savoury Spiced Pumpkin Soup, perfect for the cold autumn months. In the last few days there has been a real change in our little corner of the London suburbs. The leaves in the trees have turned the most glorious golden brown, the days are getting colder and the nights are getting darker. Autumn is well and truly here. Undoubtedly, one of the best ways to get warm as the evenings draw in is to snuggle up with a big bowl of soup. Jon and I will often make a big batch of soup to keep in the fridge and warm up on those cold, dark nights when we can’t bring ourselves to cook. Since getting a Vitamix making soup at home has become even easier. Soup is a quick, easy, comfort food that never disappoints. Today I’m sharing a seasonal soup that is guaranteed to warm your heart. Most people’s first memory of the pumpkin is as a jack-o-lantern or as, we call it in the UK, a pumpkin… That’s right. We don’t have any cutesy names for it because for most people across Britain the only time we come across a pumpkin is when it has been carved and placed in a window on 31 October. Unfortunately the humble pumpkin often finds itself chucked in the bin once Halloween is over. But what a lot of people don’t know is that they are actually edible! Once roasted, they have a love sweet taste and velvety smooth texture making them perfect for blitzing into soup. Whilst pumpkins originate from North America that’s not to say they can’t be grown in the UK too. Pumpkin patches are popping up all over the UK, just like the one we visited last October at Crockford Bridge Farm just west of London. Even though carving pumpkins can be eaten, when it comes to the edible varieties of pumpkin we’re much more familiar with the butternut squash. This recipe works just as well with any squash you can get your hands on! Because pumpkin is quite sweet, it lends itself well to cinnamon, nutmeg and ginger, three spices often found in sweet dishes and winter-y puddings. I’ve taken those two flavours but added a savoury note with salt, pepper, garlic, red chilli and a pinch of cumin and coriander. This combination of spices has plenty of heat from the pepper, ginger and chilli but is balanced out with the mellow hum of the garlic and cumin. The coriander helps to cut through all of the deep, rich flavours with slightly sharp edge. Once you’ve roasted the pumpkin alongside a little sweet potato for starch, it gets whizzed up in a blender along with onion, the pumpkin spice mix and vegetable stock. As the liquid swirls together in the blender,it goes the most vivid orange colour. the colour of autumn. Creamy creme fraiche is stirred in at the last minute which lightens the colour but adds a luxurious rich texture to the soup. A hot bowl of this soup is so tempting. As the steam rises you get all of the fantastic aromas of the pumpkin spice mix. It’s a heady combination that will win anyone over. Warm up this autumn with my spiced pumpkin soup, flavoured with ginger, cinnamon, nutmeg and more! It's the perfect starter for Thanksgiving. Peel the pumpkin and sweet potato and cut into pieces 1 inch cubed. Roast in an oven dish with a little oil at 180C for 1 hour or until soft with caramelised edges. Once cooked place to one side. In a large sauce pan, fry the red onion (diced) and the red chilli (sliced). Once the onion and chilli has softened add in the ginger, garlic and dried spices. Fry off for a further 5 minutes. Place the pumpkin and sweet potato into a blender along with the red onion, chilli and other spices. Fill the blender with the vegetable stock and blitz the contents on high for 5 minutes or until smooth. Transfer the liquid into the sauce pan and heat on low for five minutes or until the soup begins to bubble. (See note 2). Immediately before serving stir through the creme fraiche. Note 1: If you can't get hold of a pumpkin, swap it out for a large butternut squash! Note 2: If making in a Vitamix blender you can skip this stage! Simply use the "Hot Soup" function and your soup will be ready to serve straight from the blender. Keep your eyes peeled over the next few weeks for a fun craft project that will brighten up your home this autumn. In the meantime, why not check out my tutorial for making an autumn wreath. Just click the picture below. Oh I love pumpkin soup or any kind of squash. This looks lush! Autumn is by far my favourite season. Is is that time already! I love a bowl of soup for lunch when the weather turns. Pumpkin soup always reminds me of childhood with my grandma. She still makes a mean pumpkin soup. Love all the flavours and colour in this meal! Awwww how lovely Jacquee! You’ll have to share her recipe! I love pumpkin soup and this looks wonderful.The colour is so vibrant. This sounds incredible. I have never had pumpkin soup, but I have a feeling that is going to change soon! I love that you added sweet potatoes to this soup!! Looks like a must try!! Hey Jenni! Thanks for stopping by! It’s funny isn’t it – I think we often take for granted the similarities and differences between the UK and US. I don’t like the cold weather, but I do LOVE all the delicious foods that come along with it. 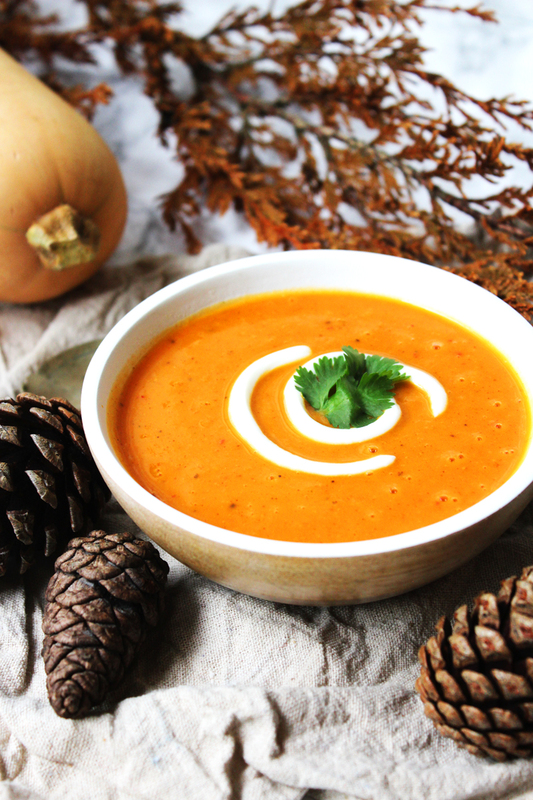 Since I am a pumpkin fanatic…this soup is right up my alley. I love soup season too! It’s lovely toasting your hands on a warm mug or bowl! I enjoyed reading your description of the spice flavors – I always struggle with how to describe how they taste and how they act together. Your choice of words is spot on! Thank you so much Jill! It is possibly the hardest part about writing about food!